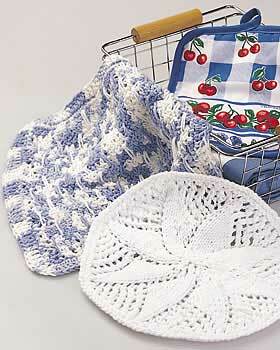 Get that dainty doily look with a dishcloth from Bernat Yarns. Wash your dishes with beauty. It fits any kitchen decor and it's an easy free knitting pattern. 1 set of four double-pointed needles 4.5 mm (U.S. 7). Divide these sts onto 3 needles. Place marker at first stitch. Rnd 1: Knit through back of loop of each st to end. Rnd 2: [Yfwd, K1] 8 times. Rnd 3 and all odd rnds: Knit. Rnd 4: [Yfwd, K2] 8 times. Rnd 6: [Yfwd, K3] 8 times. Rnd 8: [Yfwd, K4] 8 times. Rnd 10: [Yfwd, K5] 8 times. Rnd 12: [Yfwd, K6] 8 times. Rnd 14: [Yfwd, K7] 8 times. Rnd 16: [Yfwd, K8] 8 times. Rnd 18: [Yfwd, K1, yfwd, K2tog, K6] 8 times. Rnd 20: *Yfwd, K1, [yfwd, K2tog] twice, K5, rep from * to end. Rnd 22: * Yfwd, K1, [yfwd, K2tog] 3 times, K4, rep from * to end. Rnd 24: * Yfwd, K1, [yfwd, K2tog] 4 times, K3, rep from * to end. Rnd 26: * Yfwd, K1, [yfwd, K2tog] 5 times, K2, rep from * to end. Rnd 28: * Yfwd, K1, [yfwd, K2tog] 6 times, K1, rep from * to end. Rnd 30: * Yfwd, K1, [yfwd, K2tog] 7 times, rep from * to end of rnd. Next rnd: [Inc 1 st in next st knitways, K15] 8 times. Cast off purlways loosely. Crochet doilys have been around forever! I hate to admit, when I think of doily I just think of an item to place on the back of the chair, arm rest or just on a table for decoration purposes. These are great as dishcloths but I would hate to soil them. OMG! I got all excited for nothing. I do not know how to knit! My first cousin is the knitter so I will forward this link to her and I hope I can get her to make it for me. I've made this pattern before, too, and used it for a doily under a plant. It's very pretty and with a little thought, it can be made quite a bit bigger. I even thought about making it big enough for a small table cover, but never did it. It would make an awesome dishcloth! I've made this pattern before. Two or three of these dishcloths bundled together with a nice bottle of dish soap make a great housewarming or holiday gift. These are so cute! I love Bernat Blanket and Baby yarns, but I did not know they made cotton yarn. I will have to look for it. I had been using Lily Sugar N Cream, but it's always nice to have more choice!